In an attempt to maintain general high standards throughout South Tyrol, Roner were founders of the consortium to protect and promote the name Sudtirol to identify high quality, locally produced Grappa. This has become an officially recognised corporate identity seal of quality and origin borne by all Roner Grappas. 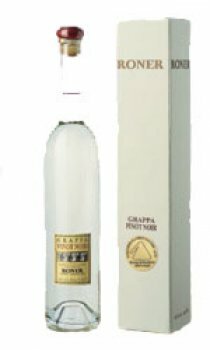 The grape skins for Roner Grappa have only been split open but not pressed and the juice or young wine is allowed to drain off naturally by gravity. They mainly use the pressing/marcs from red grapes, already fermented with the wine and, from which part of the alcohol has already developed. Part of the pressing/marcs are immediately distilled and part are temporally stored in their silos. They are stored in air-tight containers. The distillation is carried out partially in discontinuous process in small bain-marie boilers and partially in a continuous process device. Using this method Roner can separate the "heads and the tails" in a controlled way and then distil the "heart" extremely slowly. The obtained product "Grappa" matures for about 6-8 months in stainless steel containers. After this maturation the Grappa is brought to the required alcohol gradation 40% vol., 41% vol etc. then is filtered and bottled.